Baby Cartoon 2782: "A doctor's worst nightmare." 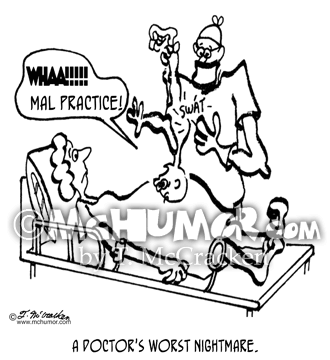 When a doctor swats a newborn on the bottom the baby cries: "Whaa! Mal practice!!" 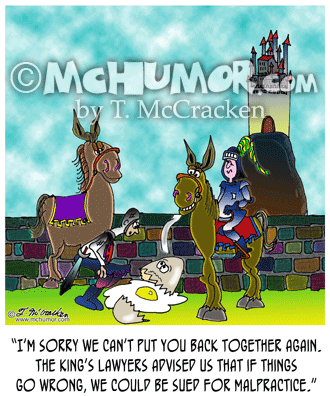 Malpractice Cartoon 7614: A knight looking at Humpty Dumpty saying, "I'm sorry we can't put you back together again. The king's lawyers advised us that if things go wrong, we could be sued for malpractice." 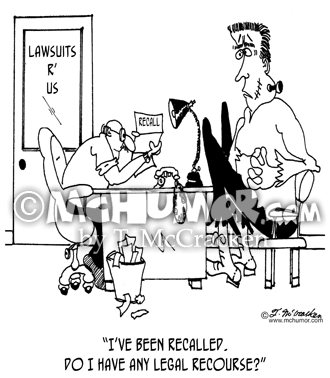 Recall Cartoon 7982: Frankenstein's monster in a law office asks, "I’ve been recalled. 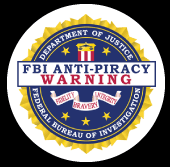 Do I have any legal recourse?" 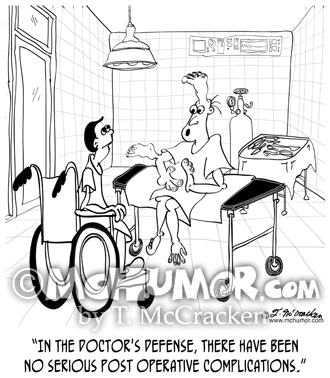 Malpractice Cartoon 8964: A patient with a foot growing out of his head says to another, "In the doctor's defense, there have been no serious post operative complications." 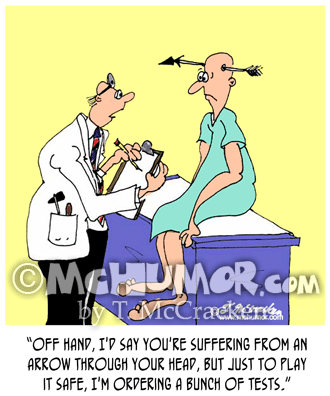 Medical Cartoon 7018: A doctor saying to a patient with an arrow through his head, "Off hand, I'd say you're suffering from an arrow through your head, but just to play it safe, I'm ordering a bunch of tests." Doctor Cartoon 2980: A nurse says to Frankenstein's monster, "You're here for a second opinion. 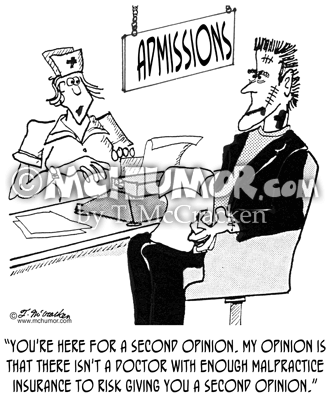 My opinion is that there isn't a doctor with enough malpractice insurance to risk giving you a second opinion." 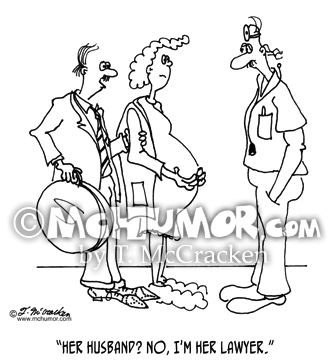 Maternity Cartoon 5493: A man with woman about to give birth saying to a doctor, "Her husband? No, I'm her lawyer." 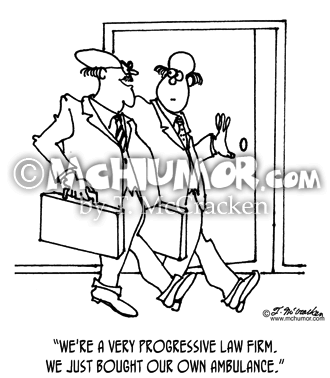 Attorney Cartoon 4389: A lawyer saying to another, "We're a very progressive law firm. We just bought our own ambulance." 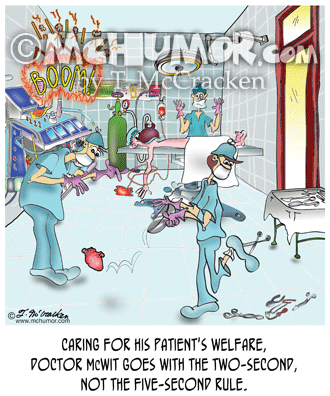 Heart Cartoon 8782: "Caring for his patient's welfare, Doctor McWit goes with the two-second, not the five-second rule. "A doctor transplanting a heart drops. 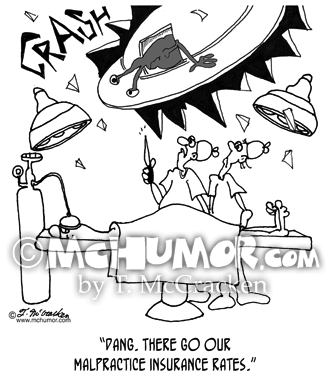 Malpractice Cartoon 8350: When a UFO crashes through an operating room ceiling a doctor says, "Dang. There go our malpractice insurance rates." 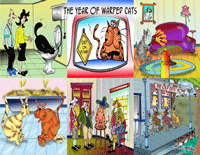 McHumor's Blog Post: Is It Art or Is It Gross Anatomy?